Tuesday and Wednesday featured "high risks" of tornadoes from the Storm Prediction Center (SPC). I have a poor history of chasing high risk events, mainly because there is just too much going on dynamically to make for an easy chase. 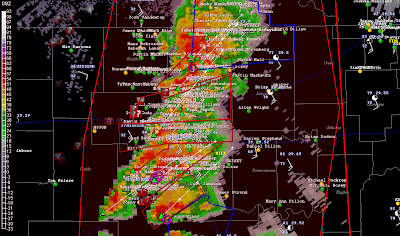 Both setups appeared favorable for long-track, violent tornadoes, but the morphologies of the storms (especially on Wednesday) made for a convective mess that made for very difficult visibility. As an example of why these type of days are so frustrating, I have included a radar image depicting all of the messy storm interactions and hundreds of chasers all searching for the same prize. These big days typically offer plenty o' CAPE and Shear leading to a large convective overturning QLCS later in the evolution. On Tuesday, we were caught too far north (we drove from IL earlier in the morning), despite high risks for tornadoes in south-central KS. We ended up staying in Springfield, MO that night in preparation for and IL play on Wednesday. The IL setup proved just as "messy." Thus, despite two high risks, I only took my camera out of the bag one time! This occurred near St. Louis on Wednesday as a clear slot began to cut into a wallcloud. After making a quick report to the NWS, the storm produced a funnel cloud that lasted for about 30 seconds. I thought this storm may produce a tornado, but quickly dissipated and became outflow dominant. In all, two high risk days proved to be two relatively expensive car washes. 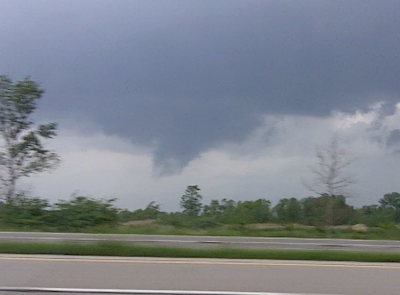 Sorry for the poor quality of the funnel picture, but it was a frame capture from Ryan's video camera. I will be down from chasing for Memorial Day weekend, but plan on chasing the following week.